My calla lily plants don't come up until April. Is that later than it should be? By the time they bloom, it's too hot to keep them blooming. 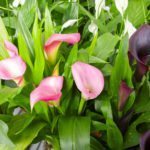 What kind of fertilizer should I use for my calla lilies? How soon should I start the fertilizer?